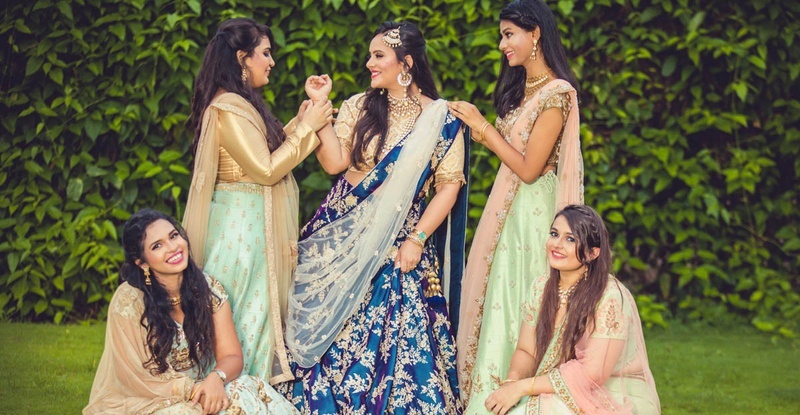 Mumbai’s Biggest Wedding Labels Came Together For This Bride-And-Bridesmaids Photoshoot And It Is Beyond Gorgeous! So if you’ve been following Weddingz.in on instagram, you probably know of our bride-and-bridesmaids contest that happened a couple of weeks ago. Well, if not: The contest required you to tag your best girlfriends and tell us why you just can’t get married without them. We scrolled through a bunch of comments looking for one that we simply loved the best - and that’s how we found Sanjana, our lucky winner. Sanjana is a bride-to-be all set to get married later this year and we were more than happy to gift her a pre-wedding shoot by one of the biggest names in the wedding industry - Romesh Dhamija Productions. Once everything was planned and in place, we met Sanjana and her bridesmaids at Kalki fashions and helped them select the perfect lehengas for the shoot. Sanjana loved a deep blue outfit while the bridesmaids complimented her in a mint, gold and pink lehenga theme. Click here to check out this mint-and-pink lehenga trend. After this, it was time to pick out the bridal jewellery! So next stop, Anmol jewellers. Out of all the stunning pieces, we finally managed to zero in on what looked best with the lehengas. From there, we were off to Renaissance for the shoot. The afternoon started off with Kajol and her team working her make-up-magic and getting the girls to look drop-dead gorgeous! We loved each and every detail, right from the glittering gold eyeshadow to the relaxed, loose curls. So guys, how did you like the shoot? Follow us on instagram to win more amazing contests. We’ll keep ‘em coming, promise!